Born in Montreal, Red Nower played high school football in Montreal before joining the Montreal Hornets (the predecessor of the Alouettes) in 1945. Nower then joined the Alouettes in 1948 and played two seasons with them (1948 and 1949). 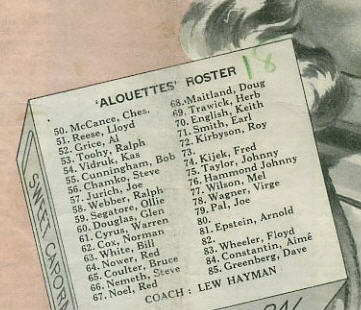 Nower wore #64 with the Alouetttes (see the lineup from a 1948 program at the right). Red Nower passed away on September 19, 2006. The Games Played stats for these years are unofficial and taken from the 2005 Montreal Media Guide.